Cheryl Broussard made two vows: She'd never fall for an abusive man, and she'd never return to her Louisiana hometown. But she's learned all too well the lesson of never-say-never. Now, back in Bijou Bayou after fleeing from an abusive boyfriend, Cheryl finds work as a Hospice nurse. While reading a dying patient's Korean War love letters, family secrets shatter Cheryl's beliefs about her family and herself and shed light on the reason she fled her hometown. When the Broussard family secrets are revealed, can Cheryl deal with the truth and accept the blessing of a second chance for relationships with her family, old friends, and with the God she never really knew? 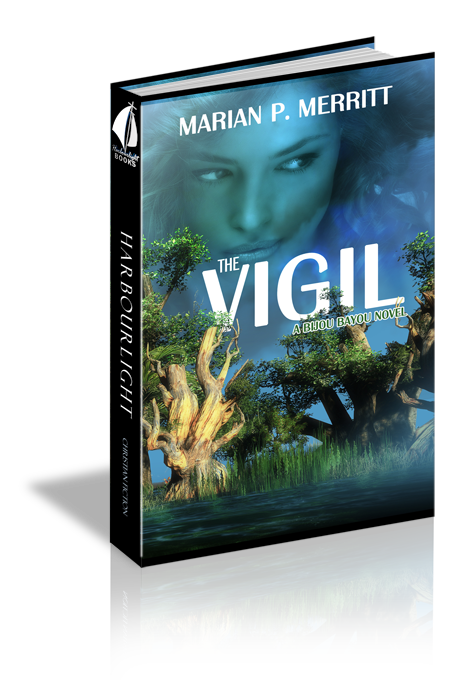 Find out in this Bijou Bayou novel from reader favorite, Marian P. Merritt. Another twist and then a slap to my jaw. My head shook from the force. He’d never hit me before. Bile rose and scorched my throat. Repulsion hit like a tidal wave while the ticking clock on the wall blurred, doubled, then returned to normal. Like the ticking clock, the repulsion remained. He’d hit me. He had actually hit me. Before I could respond, the second strike followed in the same location along my jaw. My pulse raced. A scream I struggled to contain escaped, fueling his anger. Something deep within awakened. I’d become the thing I’d detested. No. He wouldn’t do this to me. I wouldn’t be that woman. Couldn’t be that woman. I kicked his shin with all my strength while yanking my arm out of his grip. “I’m leaving. This is it Jarrod, we’re done.” I sprinted toward the front door and freedom. Rage boiled under my skin, and the desire to hurt him gripped. A feeling I’d never felt before. I reached for the red ceramic lamp on the foyer table, but before I could wrap my hand around the base, he slammed me into the wall. Thankfully, he stumbled and fell to the floor taking the lamp with him. Its pieces shattered on the unforgiving tile. The drive east from Houston to Bijou Bayou, the only place I knew I’d be safe, proved to be the longest four hours of my life. Home. At the prospect, my sweating fingers tightened around the steering wheel. But the larger revolt came when I thought about staying in Houston. I couldn’t risk being in the same town, no matter how big, with Jarrod Trumont. I feared for my life. And his. Yet, the greater question loomed ahead: could I tolerate living in the same town as my mother? With a wrinkled, liver-spotted hand, my patient, Carlton Perlouix, brushed the strand of gray away from his face. “Need a haircut. Could you?” His gruff voice echoed against the twelve-foot ceilings of the near empty bedroom in the old Acadian style house. At seventy-nine, he looked much older. Cancer does that. “Do you have scissors anywhere?” I searched his worn oak nightstand drawer, careful not to disturb the order inside. Patients who’ve lost control of so much in their life hold on to the little things, like insisting the tissue box remain in the same place, and was why he’d insisted on paying out of pocket for twenty-four hour home care. “Bathroom. Top drawer.” He didn’t waste words. Talking required energy. Energy he didn’t have. In the bathroom, a pink-tinged towel hung from a simple iron rack. The top drawer held the aroma of mothballs and a barrage of bathroom items. I grabbed scissors, electric clippers, and a wide toothed comb, and then reached for the hanging bath towel. He grinned. That Jeremiah-Johnson-man-of-the-wilderness grin. I’d seen it recently from my favorite actor in some newly crafted western. But never on Mr. Perlouix. The tough-guy grin suited him. I liked it. “Ah, one load,” he said. Deep wrinkles covered his forehead and outlined his soft violet eyes. The lines circling his lips spoke of his long history with cigarettes. Part of me delighted in helping while a tiny part reconciled that this wasn’t included in my nursing job description. Then again the man was dying. I’d do what it took to make him comfortable. The injections into his IV, which struggled to remain in his ever-collapsing veins, didn’t seem to be enough. At least not for me. “Shaved. Military style.” His lips separated the bare minimum. I’d had to lean in to hear the words. “Were you in the military?” I knew so little about this man, yet for the past three weeks, I’d watched him wither away. Waited while death slithered a little closer. No family or friends ever came. How could someone live so long and be so alone? And how could I, a stranger, share this important part of his life? “Korean.” His wrinkled hand lay on his lap with skin so thin I plainly saw the highways of veins and arteries beneath. Vessels that carried a mixture of blood, toxins, and whatever else his body chose to take in. Regardless of technology and amazing inventions, his body had the final say. And there was little else anyone could do. Except, I suppose, pray. “That must have been tough.” Snip, snip. Gray strands drifted down to his shoulders and rested there like feathers. My brows tightened. Reining my emotions proved difficult with this patient. “Why so?” I asked. He shrugged his shoulders and took a deep breath. “Sometimes you’re dead...” His eyes, burning with intensity, met mine. Sadness etched the corners. “...before your body says so.” A fit of coughing racked him, jerking him right and then left and back and forth in ways his body resisted. The last snippets of hair drifted to the floor and rested on the worn oak planks. “I suppose that’s true.” I struggled to keep my expression void of emotion. I stood bedside, scissors in hand and waited. I knew exactly what he meant. The last few months with Jarrod had killed my spirit more than I realized. The anger I’d experienced with him scared me. Daily I feared he’d find me and finish what he started. One good thing about coming home, Jarrod feared my brother more than he wanted to harm me and would never venture to Bijou Bayou. I was also fairly certain he’d already moved on to another enabling girlfriend. But the lie I’d tendered all my life hung heavy on my soul. I’d thought I was above being in an abusive relationship. Although I hadn’t stayed, I’d picked a man who could strike a woman. That crawled deep inside and coiled in my gut making me question my judgment. Carlton’s coughing eased, allowing him to take shallow breaths. I wanted to know more about this elusive man. Until today he’d asked for and said very little. Asking for a haircut seemed to move me up to a higher level of trust. Yet I shivered to think that he could be a person so cold as to chase away anyone who once loved him. Was I mistaken to think that beneath the crude exterior, a layer of compassion and depth wrapped his heart? Question 1: Why do you think it was important that Cheryl return to Bijou Bayou? Question 2: What characteristics of Christ do you see in Cheryl while she cares for Carlton? Question 3: When Cheryl reads the first letter to Carlton, at first, her curiosity is piqued but as she gets to know him better, what drives her desire to discover the identity of Lady S? Why was this important to her? Answer 3: At first she's curious, then when she realizes he could die without forgiveness she searches more ardently for Lady S.
Question 4: When we first see Cheryl and her mother the problems in their relationship are instantly visible. Do you have anyone close to you that you have a difficult time spending any amount of time with? If so, have you examined the reason? Your heart toward them? Question 5: When Cheryl left Bijou Bayou she severed many friendships. When she returned many of those friendships were rekindled. Why do you suppose that was possible? Do you have childhood friends that a reconnection would be like picking up where you left off? Why is that? Question 6: How did Vivian's revelation change Cheryl's perspective toward her mother? Elray? Herself? Answer 6: She felt betrayed then ashamed toward both her mother and Elray. She didn't trust her feelings because she'd been wrong about a situation she lived through. Question 7: What are your thoughts about Cheryl's reaction toward Carlton when she learns the reason he and Lady S never married? Question 8: Cheryl's burgeoning faith played a role in her forgiveness of her mother, Elray, and herself. What role did faith play in Carlton's life? In Vivian's? Answer 8: Carlton came to accept Christ and His forgiveness. Vivian was able to rely on Christ to understand her need to continue taking her medication and for waiting on His timing. Question 9: While Cheryl struggled in many areas, she came to accept that God could use her to minister to Carlton. Do you believe God uses anyone to show Himself? How have you seen this in your life? Question 10: At the end of the book, Cheryl says "Carlton had touched all of us in a way that made us better." Do you believe that part of our time on earth is to reflect the character of Christ so we can leave a piece of Him to those we encounter? If so, how will you take this to action in the future?